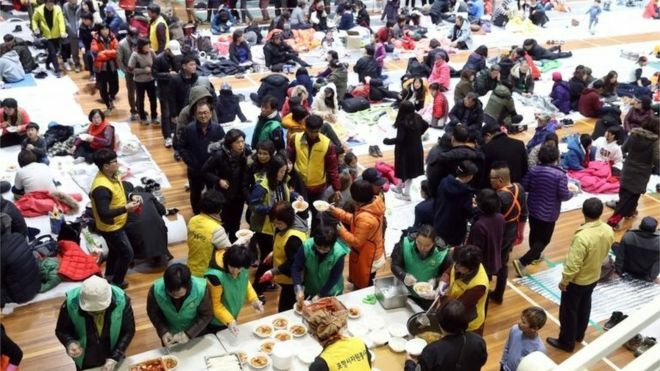 South Korea has delayed its nationwide college entrance exam for the first time ever, after the country was struck by an earthquake on Wednesday. Students and parents usually spend months preparing for the crucial exam. The 5.4 magnitude tremor hit the south-eastern port city of Pohang in the afternoon, and dozens of aftershocks have occurred since. The quake was the second-strongest on record, leaving at least 57 people injured and more than 1,500 homeless. The annual test, sometimes referred to as “life assignment exam”, has been rescheduled for next week for safety reasons. The exam is considered crucial to ensuring a spot in one of the country’s top universities, and eventually securing a good job. The exam is of such national significance that aircrafts are barred from taking off or landing for 30 minutes to prevent their noise interfering with the exam’s listening section. On Thursday the ban for aircrafts was lifted, the transport ministry said. South Korea rarely experiences tremors, but seismic activity is very closely monitored because a spike is often the first sign that North Korea has carried out a nuclear test. Last year, a magnitude 5.8 earthquake hit the nearby city of Geongju, but the damage from Wednesday’s quake has been more severe. More than 1,000 buildings, homes and vehicles have been destroyed or damaged.